Wood: an authentic, sophisticated and sustainable material. Its beauty lies in its simplicity and pure nature. With visible grains and traces of knots. The wallcovering in the Timber collection is made exclusively of Paulownia wood that has been processed with care and craftsmanship. 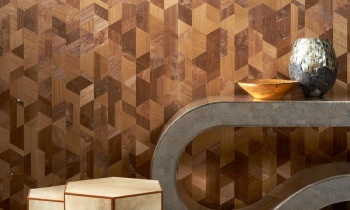 Inlaid geometric patterns produce surprising optical effects. A natural product that derives its exclusivity from its pureness. 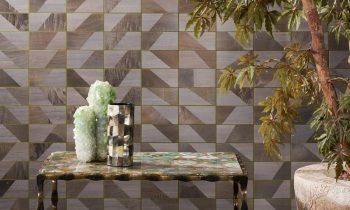 Hexagonal surfaces filled like a mosaic with various wood fragments, contrasting colours and varying shapes − whether inlaid in a line or at a right angle to one another. The result is a playful and rhythmic whole with depth from the one perspective and volume from the other. Rectangles made from wood fragments, inlaid on metal foil. 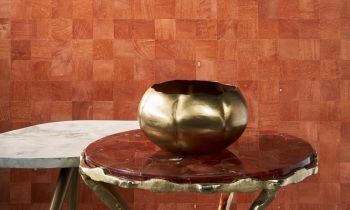 The foil emphasises the pattern and provides a sophisticated finish. Soft and subdued colours on the one hand and more intense shades on the other, but without compromising on the distinctively natural look & feel of the wood. A collage of perfect squares. Combining wood fragments from different parts of the same tree provides a lovely combination of grains and recognisable knots. No two are the same, as they form a random pattern in the inlay. A combination of flat surfaces and raised bars in a contrasting colour. Inlay at its finest, like skyscrapers silhouetted against the sky. The sense of depth in this pattern is tremendous. A genuine eye-catcher.